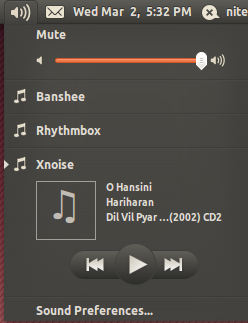 Xnoise is a fast, lightweight and minimal music player for Ubuntu based on a unique track list queuing feature where users can drag and drop tracks or group of tracks from multiple albums/artists on a playlist. The layout is quite simple with a left sidebar that shows song artists and other metadata in a hierarchical structure and a right column that shows your playlist. Xnoise also comes with lots of plugins that bring Lastfm integration, native notifications support, album covers and the new Ubuntu sound menu integration.